Stefan Themerson continued to be interested in the relationship of sight and sound. In 1956, he deposited copies of Calling Mr. Smith and The Eye and the Ear with the National Film Archive. The curator, Ernest Lindgren solicited ideas for another experimental film from the Themersons. In a long letter of November 1957, Stefan Themerson discussed his idea for a 'synæsthetic sight and sound coordinator', later on called Phonovisor, which he would like to construct. He explained, 'it is a sort of piano producing musical notes that would have a one-to-one relationship with images projected on a screen'. He wanted to start by building such an electro-mechanical contraption because he needed it to make his film. Film would be the means to demonstrate the experiment. Unlike Rimington and Scriabin who had progressed from image to music, he wanted to work from music towards film. The Experimental Film Production Fund felt unable to support Stefan Themerson in the construction of his keyboard, and this project was never realised. 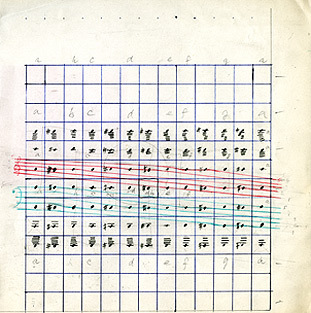 Stefan Themerson's diagram for an audiovisual score, 1958.